Finding the right cricket bat is surprisingly easy. Most of it boils down to your budget and your expectations from the bat. There are only 3 things to consider and they’re all about prioritizing your needs for the game. Cricket bats are made from two types of wood: English Willow and Kashmir Willow. The difference between the two is of performance and budget. English willow offers a great feel and performance. The wood is more responsive and gives a very strong ‘sweet spot’. Strokes feel smoother and you can easily bend the bat to your style. The drawback is that English Willow bats are the most expensive bats out there- they are the top quality bats and we suggest you only opt for an English Willow if you have established yourself well into the game. English Willow bats come in grades with Grade 1+ and Grade 1-G1 (A) being best for advanced players and Grade 2-G2 (B) and Grade 3-G3 (C) good for more established intermediate players. Grade 4- G4 is the lowest in terms of quality but will still offer the performance of an English Willow bat. If you’re transitioning from Kashmir Willow to English Willow and playing at the beginner level, we suggest you start with Grade3 or 4 bats. Kashmir Willow is a cheaper alternative to English Willow because the wood is sturdier and heavier. But it’s great bat for beginner to intermediate players who are still honing their skills on the field and polishing off the rough edges. You can opt for Kashmir Willow bats that have carbon fibre in the handle as that makes the weight lighter and adds more power in the shots. It also helps with the shock absorption on impact, that is your wrist and arms get affected less when the ball touches the bat. Grain is the next thing to look for. Found on the face of the bat, these lines speak a lot about what the bat can do for you. A higher number of grains means that the wood used to make the bat is older, giving you a better performance but also making the bat slightly less durable. Grains between 6+ to 10+ are good to go with and you can pick a higher number depending on your playing level. Size is the last thing to consider. Not only do you have to be careful about the size of the bat but also the handled. 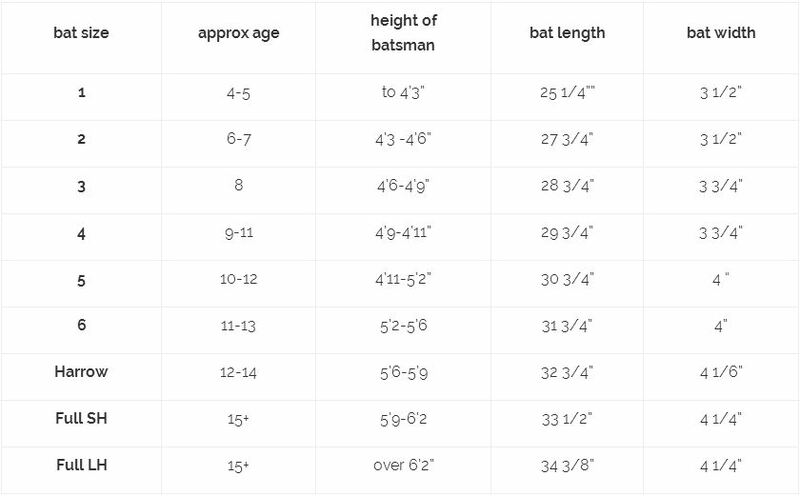 The chart below explains how to select a bat according to your height. Short Handle bats are usually the popular choice but if you’re over 6 feet tall, you might prefer a Long Handle cricket bat. When you’re playing with a leather ball, the one thing you don’t want is a week worth of cramps every time you get hit on the lower leg. As far as protective gear goes, we suggest you take as much care and devote a significant part of your budget to purchasing high quality elbow guards and batting pads that will ensure you stay injury-free. We’ve got a step by step guide for you to find the perfect batting pads as well as to ensure they stay in top shape. Traditionally, batting pads are made of leather and while they give a polished feel- they are not high on durability and are very expensive. If you’re looking for durable and cheap alternatives, PU (polyurethane) offers great performance and durability, is less chemically resistant than PVC and is easy to maintain. Some batting pads contain cane (wood) and fiberglass inserts to provide more resistance and reinforcement. Kevlar inserts add more strength than fiberglass or cane but you should only opt for these if you’re playing intense cricket. For recreational games you can settle for a simple PU batting pad. Pads often come with cotton wadding to add comfort but some pads also use d2 and d3 ‘smart fabrics’ that are very flexible, allowing full and free movement and turn rigid only on impact. So they toughen up only when the ball hits the pad. This gives you greater comfort and flexibility without compromising your protection. It makes up for the deficiencies of High Density Foam which is either tough but rigid, constricting movement or pliable but not completely able to absorb shock. If you’ve finalized the material, then the next step is the size of the batting pads. A good way to measure the length of your lower leg is to hold the tape from the instep to the knee. Make sure you’re measuring till the middle of the knee. A good way to check if the size fits correctly, is to ensure the pad covers your knee when you stand. Maintaining PU pads is easy because you can simply wipe the dirt off the surface. Leather is trickier as water makes it weaker. Use a dry cloth first. For the insides, if the fabric wadding on the insides is removable, then take it out and wash it, otherwise, leave it in a dry place for the sweat and moisture to release and then clean it using a wet towel. Cricket helmets are usually made from Fibreglass or Carbon Fibre as both are highly durable and strong materials. But where Fibreglass is heavy and a little uncomfortable for long matches, Carbon Fibre often comes combined with Kevlar to offer strength and protection while being light and easy to wear. Steel offers strength as well but it’s heaviness makes Titanium a better option if you’re considering metal but we suggest Fibreglass and Carbon Fibre are good options despite being expensive. Only go for the metals if you’re on a tight budget.